SanDisk iXpand 32 GB and JOBY GripTight POV Kit Smartphone Video Bundle for Apple/Android Smartphones. View More In Accessory Kits. Take better photos and videos with the JOBY GripTight POV Kit with a Bluetooth remote. Compatible with Apple and Android smartphones, you can stabilize your images, for a more crisp and clear click. With no app required, you won't need to worry about taking up more storage on your phone. The Bluetooth remote allows you to take photos up to 90ft. away so you can have the perfect backdrop, as you stand in front of the lens, instead of behind it. With a modular handgrip, which provides four (4) primary positions, the GriptTight is made to empower your creativity so you can get the best shot, at the best angle. CREATING MEMORIES IS UP TO YOU. You take your mobile everywhere. There are no limits. There shouldn't be limits on the memories you capture.The iXpand Flash Drive makes it easy to free up space fast and can even automatically backup your photos, videos and contacts. Simply plug in the Lightning connector and you can easily move photos, videos and other files off your device and onto the drive. From there, you can transfer the files onto a Mac computer or PC or store them on the drive. It's supports popular video formats (.WMV, .AVI, .MKV, .MP4, .MOV). TURN YOUR PHONE INTO AN ACTION CAM. The compact design of the JOBY GripTight POV Kit includes a lanyard for the Bluetooth remote, so you'll never lose track of it. A convenient universal pin joint connection makes it easy to connect to with Action Video (GoPro) accessories, or any GripTight mount, turning your phone into a quick and easy Action Cam. The cold shoe adapter and top & bottom docking systems make for easy connections and docking. JOBY SMARTPHONE HANDGRIP STABILIZER. Get better images and videos with this versatile smartphone stabilizer. The JOBY GripTight POV Kit offers a secure grip for smartphones with or without a case, to deliver you crystal clear photos. SANDISK iXPAND FLASH DRIVE FOR IPHONE AND IPAD. The 32 GB SanDisk iXpand Flash Drive is an amazing storage device for those with an iPhone or iPad that need some extra storage, or even just a way to backup photos and videos of loved ones. CREATIVE CONVENIENCE. The integrated Bluetooth certified technology for the JOBY GripTight POV works up to 90 ft. away, giving you freedom to explore new angles and shots. Paired with the SanDisk iXpand Drive app you'll get the ultimate creative convenience. DURABLE DESIGN. The GripTight POV Kit ensures high quality engineering to hold on tight. Although it's lightweight, it is still extremely strong. Made of durable ABS plastic, acrylic, and stainless steel, the GripTight is made for any adventure. GRIP, FLIP, & FIRE AWAY. The universal pin joint connection on the GripTight POV attaches to a variety of Action Video accessories, meanwhile you can safely store your footage on the SanDisk iXpand with ease. 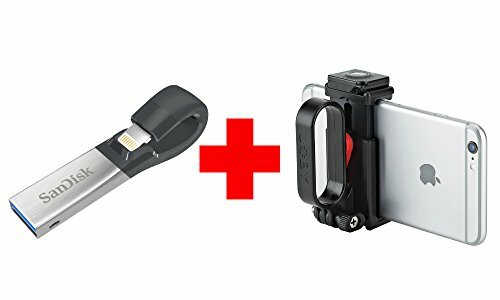 LG V30/V20/LG G6/LG G5 Fast Charger Combo Kit (Car Charger + Wall Charger + 2 Type-C Cable) - Adaptive Fast Charging uses dual voltages for up to 50% faster charging!